The following clarifications to this significant article are not intended as criticism of theDaily Express or Jon Austin. Rather they are in service to the reality the reporters and editors working today possess a limited knowledge base for the extraterrestrial presence issues. 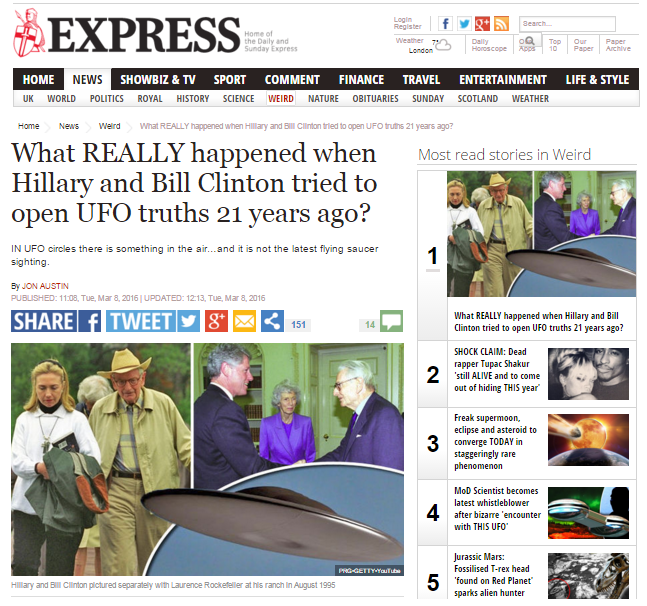 The Daily Express is contributing important political coverage. "The Paradigm Research Group is convinced aliens not only visit Earth, but secretly engage with world leaders." PRG does not say ETs have engaged world leaders. Rather, it has not seen enough evidence yet to come to that conclusion. Others make such a claim, not PRG. "Aside from Roswell, Rockefeller's negotiations included an ongoing threat of writing a direct open letter to President Bill Clinton and taking out adverts in the press, calling for full disclosure and an amnesty for whistleblowers to come forward and avoid prosecution, if his demands were not met,"
Rockefeller did "threaten" to place an ad in every American newspaper. This helped to bring Gibbons along. He did not threaten to write a letter to the President. The letter, and other reports and materials were to be created as part of the approach to the administration. A document referring to the threatened public service ad is shown below. Also, PRG prefers to use the term "witness" rather than "whistleblower." "Due to the persistence of Paradigm researcher Grant Cameron, who used the Freedom of Information Act to obtain as much information about the initiative, we know the venture continued for just over another year." Mr. Cameron is not a researcher for Paradigm Research Group. He is an independent operator. He filed the FOIA in 2000 on behalf of his own research, which he shared with PRG. "Nor have any of a group of around 23 surviving Clinton camp officials and campaigners who would have been aware of it, he claimed." The 25 surviving principals and secondary principals include 12 from the government side and 13 from the private sector.